2 Lairds Inn Court is a lovely first floor pet friendly holiday apartment in the popular town of Dunkeld on the banks of the River Tay. 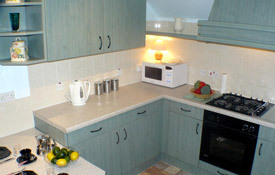 Two bedrooms - sleeps 3 + 1 baby. Accepts dogs. 2 Lairds Inn Court is a well presented 2 bedroom holiday apartment which enjoys a central location in the heart of the ancient cathedral city of Dunkeld with its own private entrance. 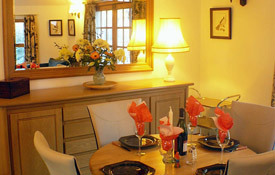 Set in some of Scotland's finest scenery, along the banks of the River Tay, and offering lovely walks and superb views. Sleeps 3 + 1 baby in cot. Dogs welcome by prior arrangement. 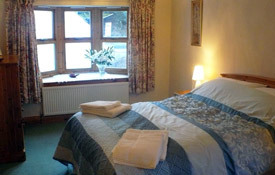 2 Lairds Court Inn in Dunkeld offers pet friendly accommodation for up to 3 guests plus 1 baby with a travel cot available on request. This is a beautifully appointed first floor flat with private access, courtyard and parking for 1 car. Accommodation includes 2 bedrooms (1 large double bedroom with wash basin and 1 single); newly refurbished bathroom with large walk in shower, wash basin, toilet and heated towel rail; Cloakroom with toilet, washbasin and heated towel rail; Dining kitchen, fully fitted with freezer, fridge, washing machine / tumble dryer, dishwasher, microwave, electric oven and gas hob; Large sitting room with living flame gas fire, double sofa and chair, recliner chair, dining table and four chairs. Flat screen television and DVD player, stereo radio and CD player; Hall cupboard with gas central heating boiler - ideal for drying wet gear! 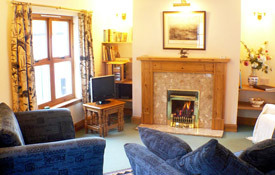 Lairds Inn Court is well-placed and is within walking distance of all the town's attractions and amenities. Leisure amenities include hotels, bistros, coffee shops and pubs offering live music and the nearby Birnam Arts Centre. There is a huge variety of pastimes on offer for the energetic from skiing, golf, walking, fishing, canoeing, cycling, shooting or for the more sedate of us simply relaxing on the banks of the river. The accommodation also benefits from being very close to bus routes, trains and the A9 dual carriageway providing easy access north and south to the main motorway network. Perth is some twelve miles away, which in turn links with all the major cities and airports in the central belt. Dunkeld is the gateway to the Highlands and within easy driving distance of Edinburgh, Glasgow, Aberdeen and Inverness. Dogs may be welcome by request at an additional charge of £20 per week.